Opponents of wind energy packed the Ausable Bayfield Conservation Authority board room Thursday. They were there to ask that the board approve their request for a moratorium on any further development of wind energy until a study could be conducted that would show that development had no negative impact on the surrounding natural environment. 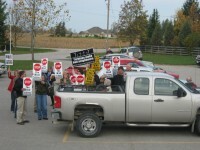 Muriel Allingham is a member of the Middlesex-Lambton Wind Action Group. She says current regulations would allow a wind turbine to be placed within 120 metres of a forested area. She says animals hear the same sounds people do and that could drive wildlife out of the area. Allingham also feels the Green Energy Act has removed all local authority for permitting or locating wind turbines so she’s grateful that community groups and organizations like the Conservation Authority are recognizing the threats of wind energy to the environment. Members of the Ausable Bayfield Conservation Authority did approve the group’s request for support. Posted on October 25, 2012, in Environment, Take Action. Bookmark the permalink. Leave a comment.